The Ruins of the Buddhist Vihara at Paharpur comprise a Buddhist Monastery dating from the late 8th century. 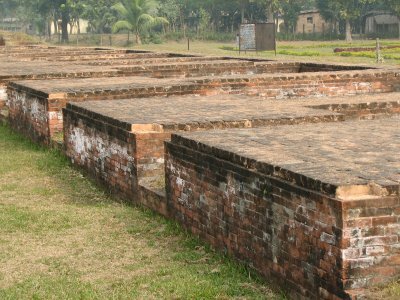 The site is located in Paharpur, in the northwest of Bangladesh. It is said to be the second largest single Buddhist monastery south of the Himalayas. It was made a WHS as a tribute to the Pala dynasty, that ruled Bengal and Bihar for 3,5 centuries from the middle of the 8th century. The monastery is built as a quadrangle, measuring 281 meter on each side. All outer four wings contain monastic cells, 177 in total. In the center of the vast open courtyard of the monastery stands the shrine. Its remains are still 21 meter high and have three gradually diminishing terraces. The walls were built of burnt bricks, some ornamented with motifd of flowers and seated Buddhas. There were also bands of terracotta plaques in rows all around the terraces. From the 12th century on, after numerous attacks by invaders, the monks left and the monastery buildings suffered decline and desintegration. The Somapura Vihara of Paharpur is located in the middle of some industrious villages. The monastery can be seen already from far. We first stop at the museum. It has some original ornaments (the ones at the site itself are largely replicas). The remains of the monastery are now in a peaceful environment. Two children are cutting grass. 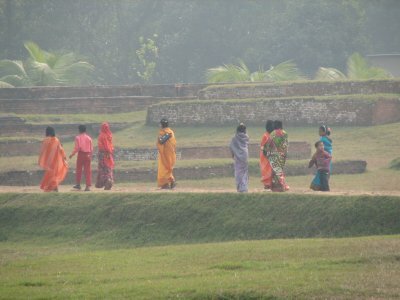 A woman is drying saris on the field. Almost all of the archeological terrain is covered by grass. The monasterial remains have been hidden under the same grass and stones for centuries, after the monks left in the 13th century. Locals thought it to be a hill, hence the name Paharpur (hill town). The monastery complex that was discovered behind the rubble had 177 monastic cells, a water pit, a kitchen, various stupas en the centrally located main temple. The whole complex is much bigger than I had anticipated. Because of its location (in the far northwest corner of Bangladesh) it doesn't see many visitors and also isn't widely known. The whole area seems to be well cared for, although many of the bricks are in need of repair. Fortunately there are many brick factories around. Though the site is a national asset it, like other such places in the country, is not taken care of properly. Some of the excavated parts are being destroyed slowly / stealthily as they are used as walkways or dwelling places. Actions should be taken to protect the site but not destroying local settlement. At the same time the area should be excavated extensively. The Paharpur Archaeological Site Museum was the first of its kind in the then East Pakistan.I myself as its first asstt custodian arranged the museum single handed.I expected a promotion,but I was transferred to the epigraphic section.As a Baptist Christian I was taught to be dutiful right from my childhood and at Paharpur I guarded the ruins as a faithful watch dog.All artifacts described in K N Dikhshit's book were there in 1962 when I resigned as I found section of excavation and exploration was very lucrative yo my bosses. I visited Paharpur last month, May, 2010. 1) In one of the sides of the site, there was no wall, rather a barbwire fence only. 2) On the other side, where there was the wall, I felt walls around sites like these could have more of the archaeological kind of look. It would preserve the ambience of the place in a much better way. 3) This place very happening in its time. But, its story is told in two mere black and white signboards. They were more like giving information than the story. What happened in each of those areas, what exactly could have been there inside the main high building, I wish I could find. I wanted to know what used to happen in each of the specific areas in that huge premise, where the monks used to sit, where new ones were taught and more. 4) This was once a very sacred place to Buddhist people and climbing an archaeological monument like this would be prohibited in almost any country of the world. But here, I found no sign telling not to climb to the top of the monument (as opposed to what I saw in another vihara at mainamati in Bangladesh, which is a tentative WHS) and many people were, indeed, climbing up to the top. 5) I wanted to know what the terracota figures actually depicted but could seemed to know details. I visited last September,2009. Really it is an enjoyable place.I din't want to leave despite the night it is so beautiful.I recommend to build boundary wall in the norther side, otherwise it will be difficult to protect the beauty and archeoalogical heritage. 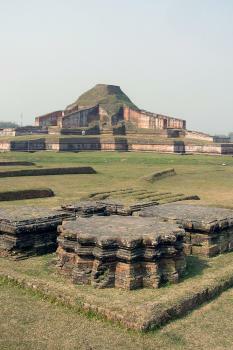 The “Somapuri Vihara” at Pahapur is said to have been the “biggest Buddhist monastery south of the Himalayas”. Whether this is true I know not but it is quite an impressive site, albeit not up to some “world class” Buddhist ruins such as Borobodur or Anuradhapura. One of its most pleasing aspects is that it is set deep, deep, DEEP into the Bangladeshi countryside. Getting there is a pleasure in itself as you pass the myriad of rural activities which characterise the Bengali way of life. 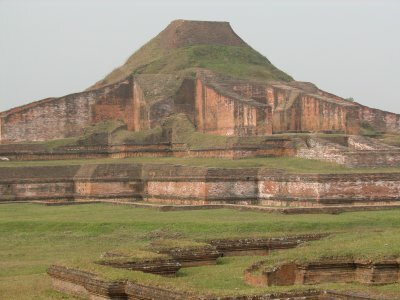 The site consists of a large quadrangle of some 170 monastic cells set in a high wall/earthwork and looking inward (photo) to a 3 level Stupa now largely ruined but originally containing, presumably, Buddha statues in shrines set deep into each face of the structure. There are also various other structures within the quadrangle. A visit (allow 2 hours) is likely to consist of a walk around the outer wall and then round each of the 3 levels of the stupa whilst taking in some of the other structures. Around the Stupa itself you can see examples (some original and some modern) of the terracotta “tiles” which decorated the walls of each level – a mixture of Buddhist, Hindu and Jain artwork (Buddhism reached its zenith in Bengal during the 8th to 11th centuries before being replaced by a Hindu resurgence in 12th century but was probably always heavily influenced by Hindu and aboriginal polytheistic aspects). The Pahapur museum also contains some of these, although we found the best examples of this type of decoration in the museum of another Bangladeshi archaeological site the Salban Vihara at Mainimati (on the Bangladesh tentative list). If you go to Bangladesh it would be a shame to miss this site but it is rather out of the way in the Northwest of the country (although there is much else of interest up there) and I couldn’t describe it as a “must do” – if you see Mainimati which is more accessible and on the route to the coast and the tribes of the Hill Tracts you will get the general idea of what a “Vihara” was like! Built in the 8th century: The Paharpur Vihara, known as Somapura Mahavira, was built by the Pala Emperor Dharmapala (AD 770-810).